Now at days, Instagram, the most powerful social media platform, is the one that drives trends and inspires people. Its all about communicating through images, so you know when you post something, it has to be interesting beautiful and memorable. 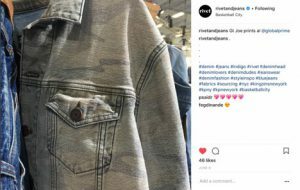 That’s the case of the lasts pictures posted on Sourcing Journal and Rivet Instagram feeds. We are happy to tell you. Yes…. they are ours. 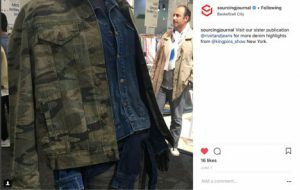 Global Denim managed to pull great camo outfits showcased at the mannequins on their booth during kingpins, and they were memorable. Not only they inspired designers and the general audience of the show, but we are happy that they are being carried away through this platform to get to motivate more people. We always create with love and are more than ecstatic when our work id appreciated by others.